The Skinny: Popular Stephen Chow comedy that has about a gag a second. Most of them are uproariously funny, too. Hilarious Stephen Chow comedy that features Hong Kong's King of Comedy at his most likable. Chow plays a dumb, endearing delivery boy who tries to win the heart of local beauty Christy Chung, but he’s a wimp who can’t protect her from the likes of Cheng Cho as the sleazy judo instructor. 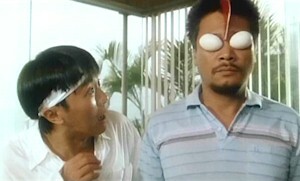 Chow decides to undergo training from Ng Man-Tat, who plays a crippled huckster called Devil Killer. He swindles Chow out of large sums of money while teaching him useless kung-fu. Not realizing it, Chow thinks he's become an invincible kung-fu master and resolves to protect Chung. Eventually Chow has the opportunity to save her while wearing a large Garfield mask, which could qualify as one of the funniest things ever put on film. Still, he cannot reveal his identity because everyone, including his karate-wielding nemesis (Lam Kwok-Bun) wants to take credit for his heroic deeds. To prove himself and win Chung's love, Chow can only do one thing: challenge his arch-rival to a duel.